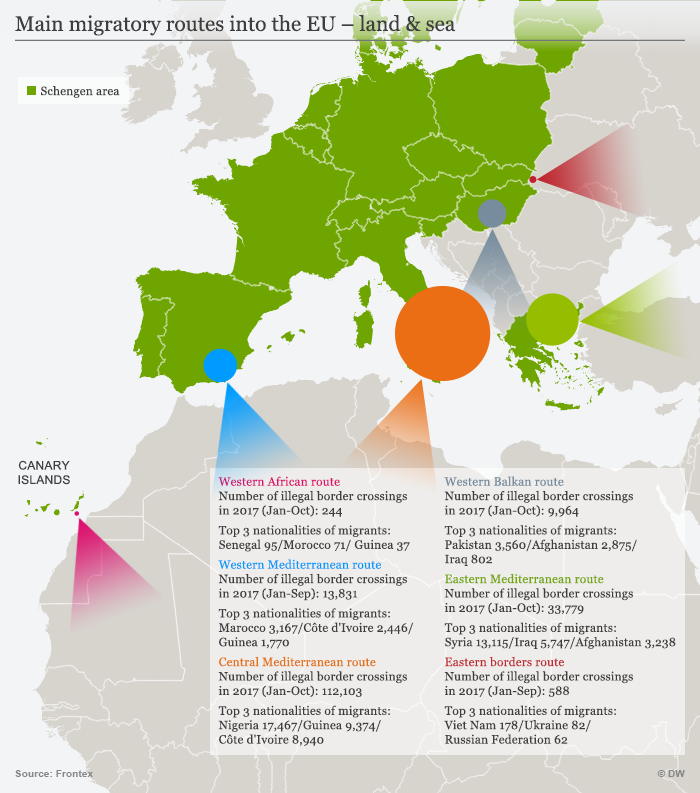 What are the recent developments of migration movements to Europe? What are the refugees' main destinations, the main routes? InfoMigrants gives an overview of 2017. War, violence and poverty have uprooted millions of people around the world. Consequently, the migration flows, particularly to Europe, continue. Whereas in 2016 the top citizenships of asylum seekers in Europe were Syrians, Afghans and Iraqis, in 2017, these were Syrians, Afghans and Nigerians. 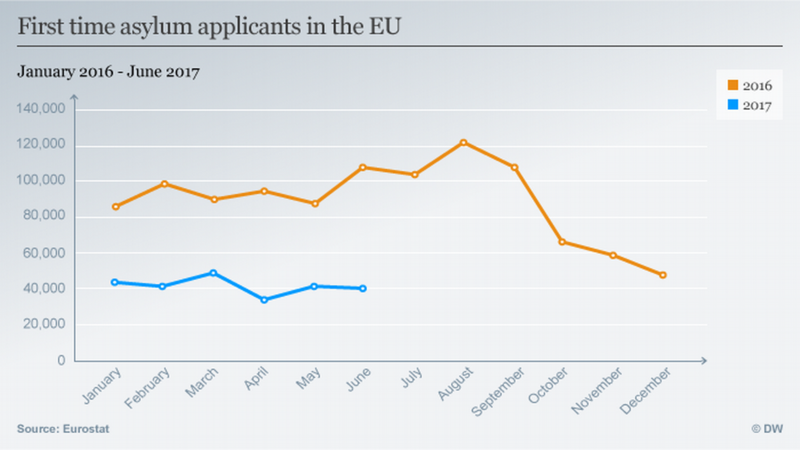 The number of asylum applications in the European Union (EU) decreased in 2017 compared with 2016. According to the data from the European statistics agency Eurostat, the number of first-time applications decreased by 54 percent in the second quarter of 2017 compared with the same quarter of 2016. Eurostat states there were 149,000 asylum applications during the second quarter of 2017. That was 175,000 fewer than the same time period in 2016. Refugees take different routes in order to reach their destinations in the EU. The main migratory routes are the Western African route, Western Mediterranean route, Central Mediterranean route, Western Balkan route, Eastern Mediterranean route and Eastern Borders route. The Central Mediterranean route is most frequently used.The EU border surveillance agency, Frontex, collects data on illegal crossings. The number of asylum seekers peaked at 1.26 million in 2015. In the same year, more than 3,000 refugees lost their lives in the Mediterranean. This number increased in 2016, when about 5,000 lives were lost. According to the International Migration Organization (IOM), there were more than 115,000 arrivals by sea in 2017 through August 2. However, in that same time frame, over 2,300 people are believed to have lost their lives in the Mediterranean. This figure does not include the number of missing persons. The Mediterranean region accounts for the largest proportion of people dying during their migratory crossing. Three fourths of migrant fatalities worldwide occur here. In the second quarter of 2017, Germany registered the highest number of first-time applicants -- 28 percent of all applications in the EU. In this regard, Germany was followed by Italy, France, Greece, and the United Kingdom. However, Greece had the highest per-capita rate of first time applicants in the EU during the second quarter of 2017. 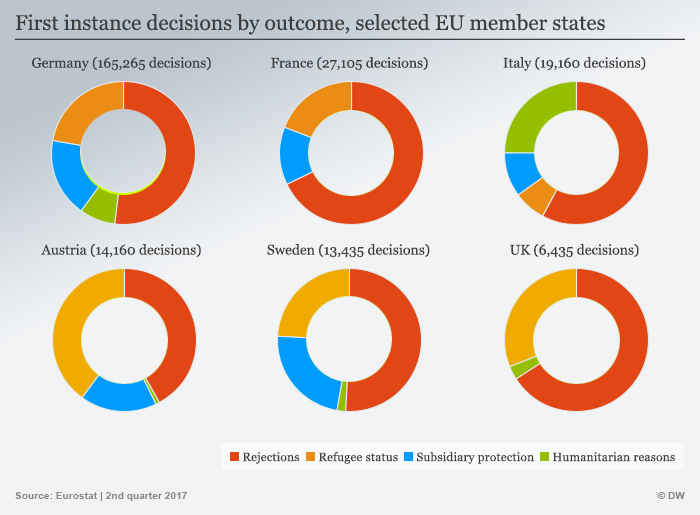 Less than half of all decisions (46 percent) on asylum applications were positive in the second quarter of 2017in the EU. Germany was the country that issued the most first instance decisions. According to reports, Germany issued more asylum decisions than all other EU countries combined in the first half of 2017. The country with the highest rate of asylum application rejections was the UK, and the country with the lowest was Austria. Austria also issued the most refugee status decisions. 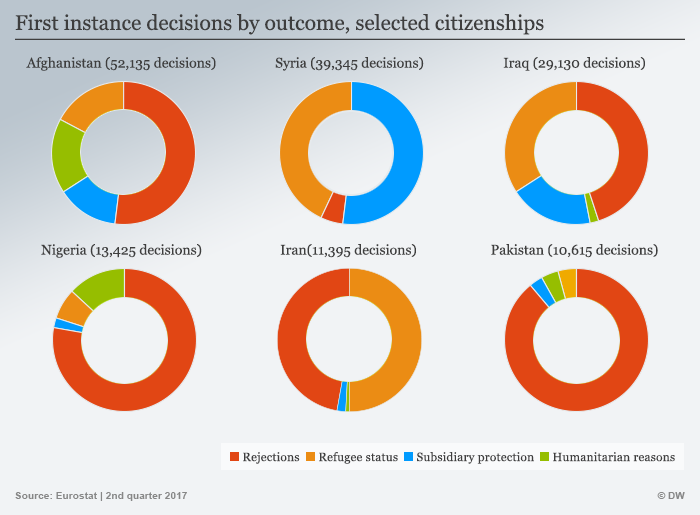 However, looking at the citizenship of applicants, Pakistanis had the highest number of rejections, while Syrians had the lowest. Refugee status was proportionally granted the most to Iranians and the least to Nigerians. Refugee status is the highest level of international protection, according to Eurostat. According to reports by the German broadcaster NDR, the number of asylum seekers appealing their decisions in Germany has risen significantly. In the first half of 2017, nearly every second ruling made by the Federal Office of Migration and Refugees (BAMF) was brought before a judge. Only every fourth ruling was taken to the court in 2016. The chances of success have also increased. From January until July 2017, the German courts proved the plaintiffs rights in more than every fourth case. In 2016, this was only in more than every tenth case. In case of a defeat, BAMF has to meet the costs. Hence, more favorable rulings for asylum seekers also mean more costs for BAMF. According to NDR, these costs topped 19 million euros through November 2017. This is more than twice the costs through this point in 2016. Migration has been an important issue in the EU in recent years. According to the Eurobarometer survey done in 2017, 73 percent of Europeans still want the EU to improve the migration situation.